I went to Portland for a family wedding a while ago. Does this sound a bit familiar? That’s because I covered my astonishing powers of observation in this post here. But wait, there’s more! For the low, low price of $0 (all you pay is separate shipping and handling), here is another story of shenanigans from Portland. Did you know that there is a whole city located under the city of Portland? A series of miles and miles of underground tunnels and areas stretch for over 5 miles under this city. 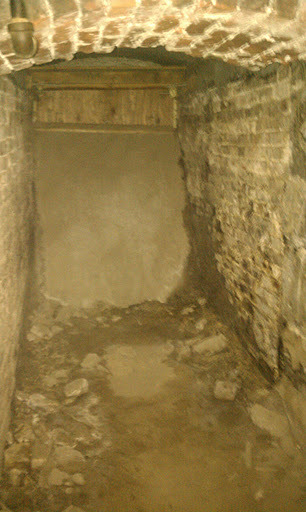 These “Shanghai Tunnels” are in the basements of the buildings and they connect to the other buildings through brick and stone archways. This connects under the streets create a series of tunnels that get you from one side of the city to the other. Or rather, they did, they don’t connect like that anymore (damnit!). 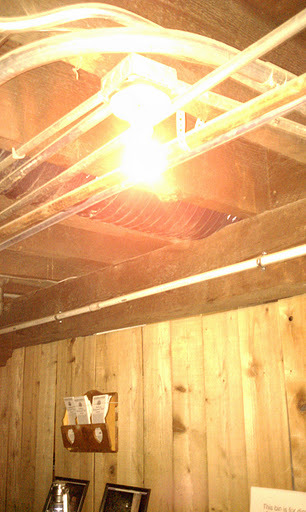 These tunnels have been featured on many haunted/ghost hunter shows and has had many reports of unexplainable tings being seen. 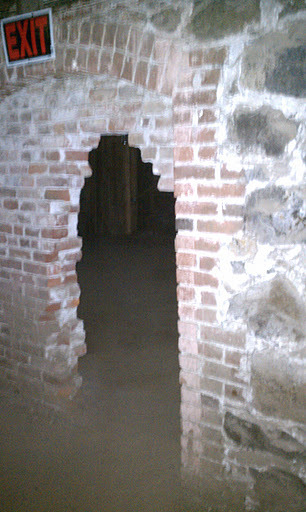 The promise of exploring a historical area, that is underneath an existing city, is a nice escape from the 90 degree weather, was involved in illegal activities, got me get away from from bickering family and the possibility of ghost hunting are a lure that I could not hope to be strong enough to resist. 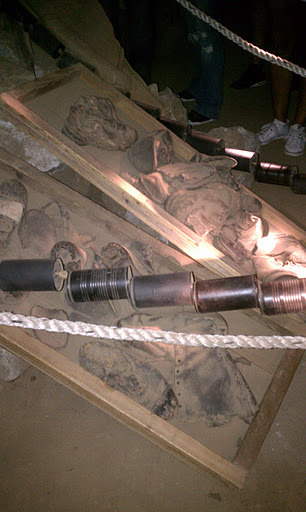 All items featured in the tunnels have been found in the tunnels by the historical society that is excavating them. Once you open the giant metal doors in the sidewalk, you walk down a steep steep staircase down into a long tunnel. You grab a flashlight and keep walking. Until you see this.. 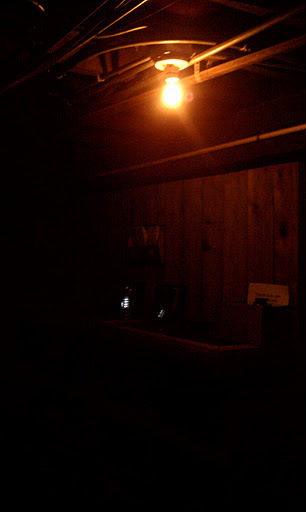 This is the area when the lights have been turned off. 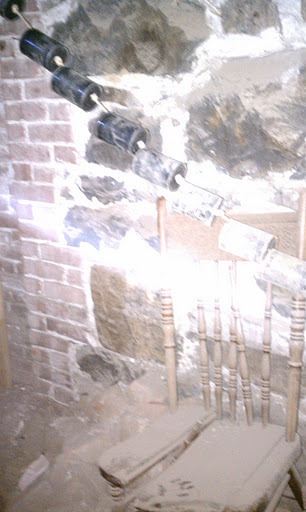 That light is a red bulb that is on to show what these passages looked like when you were using candles or lanterns. It is DARK! If you were doing something illegal, wouldn’t you want to do it somewhere that people couldn’t find you? Cue the tunnels! 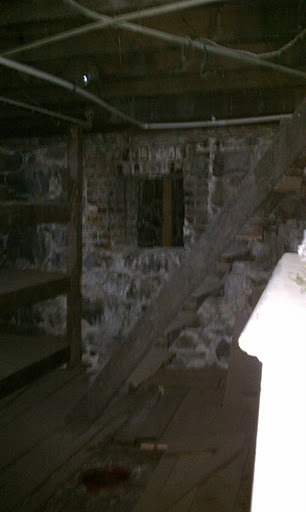 This is an opium den, where people would pay for the bunks to lay in while they were chasing the dragon. 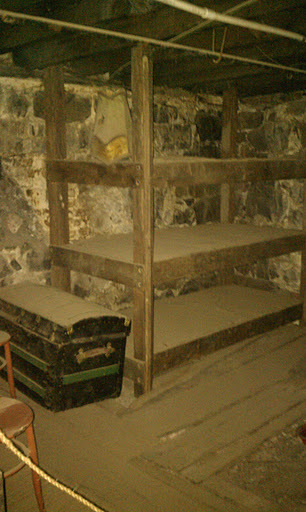 The top bunk was the least expensive, what with the chance you would fall off the bunk and hurt yourself. The bottom bunk was the most expensive and convenient. 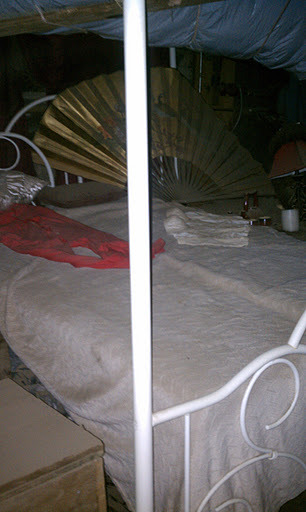 Here is another shot of the opium den. 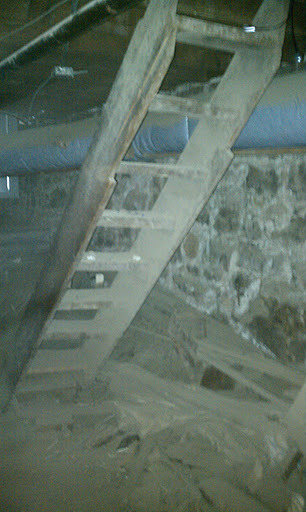 The stairs went up to one of the restaurant area alleys..easy access. Already drunk? Now get high! Oh, you wanted more? Fine. This is a place where the people watching the “compelled laborers” would stay. The cans are the alarm system.. 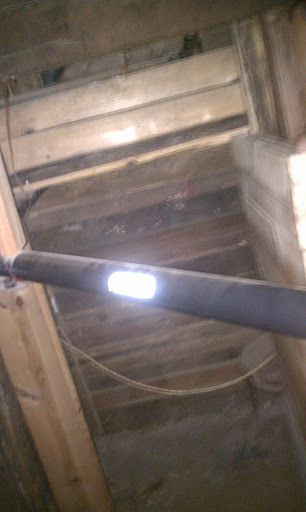 If someone managed to get out,in the dark and not knowing where they were going, they would run into one of these. Then the Shanghaiers would know were to find them. These are miscellaneous artifacts found so far. Buckets, spoons, tools and more. This is one of the passages from one tunnel to another. Usually a man with a chair and the alarms were somewhere near here. I am neither a man or an alarm. 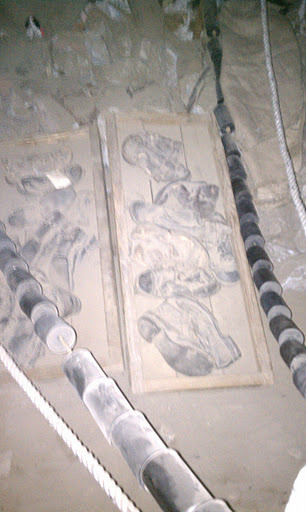 These are the shoes found in the tunnels. If you were one of the lucky men “asked”to join a crew they took your shoes and threw you into a small, small cell with about 25 other men. This is why they took your shoes. 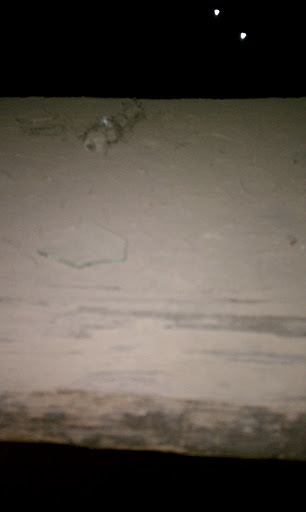 If you managed to get out, and bypassed the alarm you would be walking on pieces of broken glass. Glass covered the ground so you were crippled by shredded feet. This is hard to see, but this is the inside of a cell. 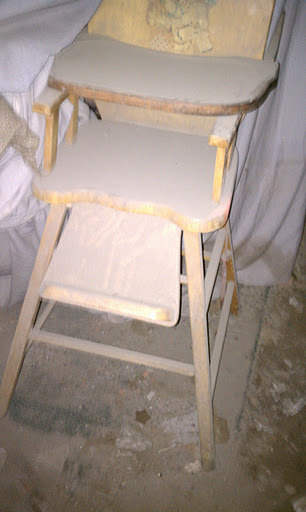 The cell holds one person and a chair. 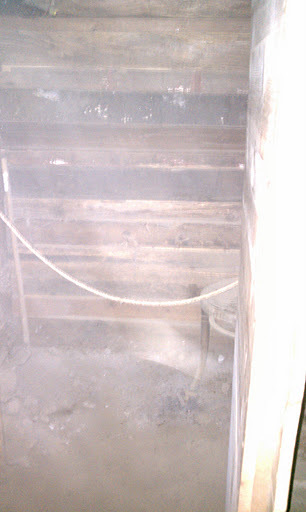 More specifically, this is a cell where they would put women who were being sold into prostitution. In the course of investigating this practice in the 1970’s, one former crimper claimed he could break a woman of the idea of hope or escape in 8-12 hours. This is the same box. Reports are that there is a smell of perfume in this area and the door to the cell opens on its own. 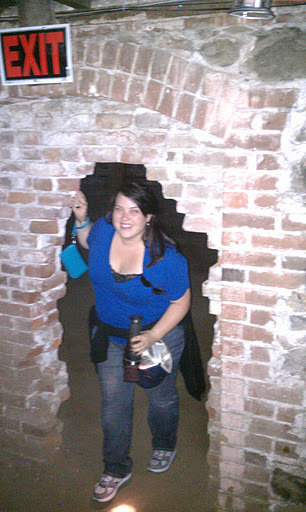 This is a coal chute…or maybe a convenient area to roll drunken men into the underground. Either way, it was useful to someone. Portland is one of the only cities known to have used “dead drops” as a frequent method of gathering able bodied men. Imagine you’re standing at a bar drinking and having a good time. 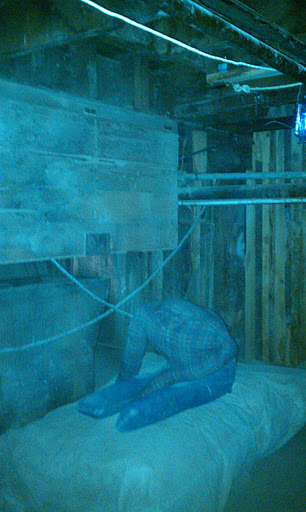 Suddenly the floor drops out from under you and you land in the basement on a stuffed mattress. Congratulations, you have now been shanghaied. No idea why these pics, and only these pics mind you, are blue. 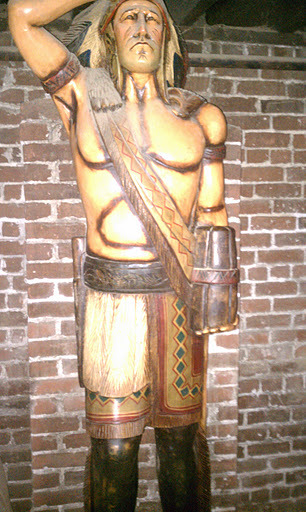 This wooden Indian was also shanghaied by the crimper Joseph Kelly. Apparently he had a deadline and could find no man that was as impressive a figure as this statue. So he wrapped him up, told the captain he was unconscious and not to wake him up until they were waaaay out to sea. Because of the impressive figure, the captain paid him the nice fee of $50 for this! 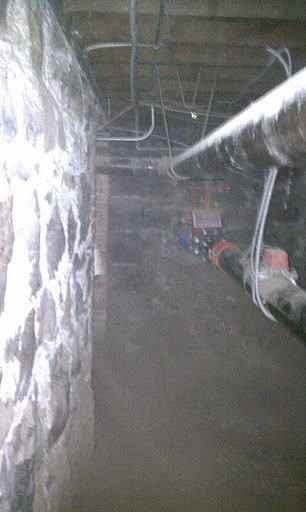 Because these tunnels are underneath the buildings above, these are pipes that the buildings need for modern convenience (water, sewer, etc…) I’m so short, I fit under these with no problem. More stairs to nowhere. It is rumored that there were multiple layers underground. Some went three or four layers down. 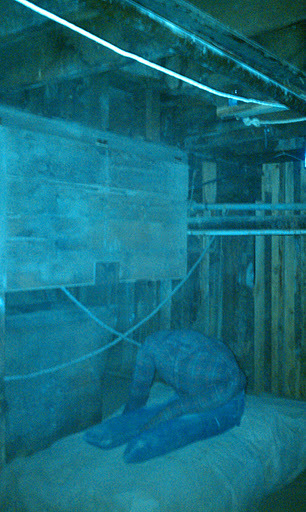 Once prohibition came about, what better place for an illegal bat than underground? Then, add in some prostitutes. 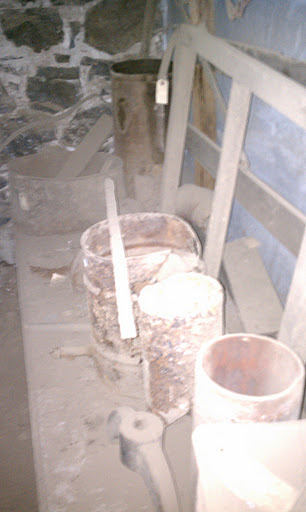 All of this stuff was found underground. The fan, the bed frame, the materials, the cups…all of it. Plus you really only need one girl, cause she just says “Come around the corner” and then the men walk into some friendly neighborhood crimpers. This place was fascinating and tragic. To think that this practice was going on well into the 1900’s this place makes you think about the things people are willing to do to make a buck. Did I see a ghost? No.